Cultural Sites of Al Ain: Hafit, Hili, Bidaa Bint Saud and Oases Areas represent examples of construction, agricultural use and water management in the desert since protohistory. The designated site is a serial nomination of 17 locations. Al Ain is the second city in the Emirate of Abu Dhabi, a pretty large one with over 750,000 inhabitants. It actually lies closer to Dubai than to its own capital, Abu Dhabi. I had somewhat underestimated these distances during my trip planning, and also wanted to see the recently opened Louvre museum and the Sheikh Zayed Grand Mosque in Abu Dhabi. So I cut my visit to Al Ain short to the Al Ain Oasis and National Museum to fit it all into a day trip from Dubai. 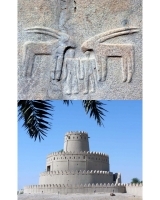 The oasis and national museum comprise only 1 out of the 17 inscribed Cultural Sites of Al Ain. Both places are very conveniently located next to the bus station of Al Ain, which is served every 30 minutes or so by comfortable direct buses from Dubai’s Al Ghubaiba Bus Station. The oasis is easy to see near the bus station, and the national museum is signposted. I started at the museum, which charges a 3 dirham entry fee. At 0.66 EUR this is only a nominal sum, comparable to the fees I paid at similar sites in Oman. I guess these public museums are heavily subsidized by the government. I never encountered many visitors, often I was the only one. This museum is quite interesting, displaying mainly the archaeological findings (lots of pottery) from the various Al Ain locations such as Hilli. I peeked into the old Sultan Fort next door as well, but they were busy with maintenance inside and I don’t think there’s much to see. At the entrance gate to Al Ain Oasis I found a friendly soldier standing guard, with a pile of leaflets in front of him to hand out. Al Ain was the first venue during 2 weeks in the Gulf where I received a pretty ticket & a brochure worth keeping. It includes a map of the oasis, but it’s not terribly large anyway and there are signs at every intersection. 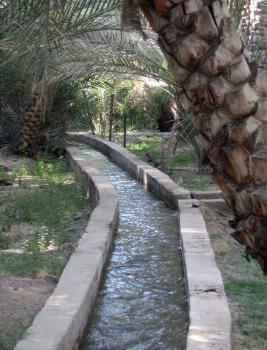 The palms in the forest supposedly are watered by a falaj irrigation system like the ones that I saw in Oman. But here no water was flowing through the irrigation channels - it would not surprise me if they keep the area green by watering with a garden hose. For the birds in the neighbourhood, so many trees together are a godsend and I heard many of them singing. One can walk all the way across the oasis to the Al Ain Palace Museum, the Eco Centre and other interpretative elements. I turned right about half way, so I ended up near the bus station again. It's a pleasant walk but not exactly exciting. This site lies only about 185 kilometers from Bat and Al-Ayn in Oman, where I was the week before, and it has a lot in common with it. The same is true for the Aflaj irrigation systems. Al Ain is much more urban though and less romantic than the 2 Omani WHS. Finally a warning for future daytrippers: I did make it to Abu Dhabi in the end, but had not enough time left to see both the Louvre and the Grand Mosque. I choose the Louvre, and only saw the Mughal-extravaganza mosque from a distance. A one way trip by bus between Dubai and Al Ain or Abu Dhabi easily takes 2 hours, and the bus between Al Ain and Abu Dhabi even needed a very slow 2.5 hours. The Cultural Sites of Al Ain are currently the only World Heritage Site in the United Arab Emirates, though hopefully more will be inscribed in future years. One of the largest components in this inscription is the Al Ain Oasis, easily accessible in the center of town. I visited this oasis in September 2012, as the date harvest was under way. Workers were sorting dates on the oasis grounds, and one of the workers gave a demonstration of how they climb the trees to reach the date bunches. As I wandered through the grounds I had to cross several times over the network of water channels fed by underground tunnels that compose the "aflaj" irrigation system. The shade of the oasis was a welcome relief from the desert heat, and I quite enjoyed my time there. Once I left the oasis, I visited the nearby Al Ain National Museum, where I learned more about the history of the region, from early nomadic lifestyles to the oil boom of the present. Like other reviewers, I also took a trip to the top of Jebel Hafeet, which provided a great view of Al Ain and neighboring Oman. Logistics: Al Ain Oasis is within walking distance from the center of town, but a car is necessary to reach other inscribed locations outside downtown. I visited this WHS in January 2015. It's made up of a series of sites 1.5-2hrs away from Dubai and it makes for an interesting day trip if planned well and visited by rental car. Driving is definitely no problem with a straight 6 lane highway and the GPS navigator was merely necessary to visit the different sites while I got to Al Ain. The first site I visited was Jebel Hafeet and although it is a great way to enjoy a panoramic view of Al Ain and several tombs along the way. However the remains of what was found in the tombs can be appreciated in the Al Ain National Museum not to be confused with the less interesting Al Ain Palace Museum. The Al Ain National Museum costs 3 dirhams to visit but is definitely worth visiting to get a detailed overview of the different forts and watchtowers around Al Ain and also a collection of artefacts and pottery found in the tombs. 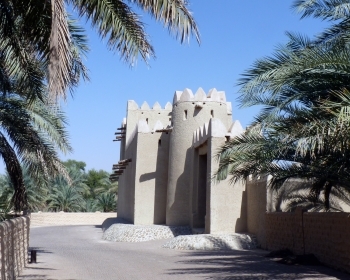 The Al Ain National Museum also houses the Sultan Fort and just next to the entrance one can access the Al Ain Oasis for a lovely walk in the shade provided by the numerous date palm trees irrigated with the "aflaj" system. Next I visited the splendid and photogenic Al Jahili Fort. The fort is open everyday except on Mondays and it houses an interesting photo exhibition. There's nothing special inside left to visit but I enjoyed the overall structure and watchtower housed within the high walls. After a quick visit to the Al Qattara Oasis, I finally ended my visit at the Hili Archaeological Site which is also free to visit. It's more of a public garden however it houses good examples of restored tombs, the most important of which has an embossed engraving of 2 oryx and 2 men. These cultural sites were interesting to visit and I think that it's a good thing that they made it on the WH list even though urbanisation has taken quite a toll on them. What prior image do most of us carry of an “oasis” site like Al Ain? Sand, palm trees, donkeys, camels? Well, as the photos in the main museum there show, Al Ain was indeed like that in the early 1960s but nowadays, with a population of over half a million it spreads out across some 40 sq kms, connected by a network of 6 lane highways with roundabouts every 2 or 3 kms where “devil takes the hindmost” among the speeding crowded traffic! We realised of course that UAE had developed significantly over the past 50 years. The “wonder” of modern Dubai was well known to us but I had perhaps not realised the extent to which this development had spread inland to Al Ain (which is part of the state of Abu Dhabi). The place was known to me long before it gained WH inscription as I am a “collector” of locations where somewhat bizarre historical events have occurred and Al Ain is one of these. In 1952 it was the site of a military stand-off involving Saudi Arabia (SA) and UK in which SA was backed by the US! With Arabian frontiers not fully defined at that time, SA moved soldiers to the Oasis of Buraimi to enforce its historic claim on the area also claimed by the Sheiks of Oman and Abu Dhabi. UK had treaties of protection with both Oman and Abu Dhabi and “officered” their troops and looked after foreign relations. In the end SA backed down and the Oasis was split between the other 2 countries –which explains the rather strangely shaped frontier which this WHS in part follows. Nowadays Al Ain is known as the “Garden City”. High rise building has been forbidden but, despite this, the whole area is heavily urbanised behind the confusingly similar tree lined highways which hide the continuous blocks of housing and the occasional shopping mall. It is also a “get away” location to escape the coastal cities and has a fair number of hotels and resorts. Originally I had thought of trying to fit a visit into a 1 day stop-over but soon decided that there were just too many different aspects to see in such a short time so we drove down from Dubai and back across 2 days seeing other aspects of interior UAE as well. On reflection, as the drive is under 2 hours, if you concentrated solely on the “best bits” of Al Ain and had an overnight night flight out of Dubai then you could do it in 1 day. The WHS consists of 17 elements in 4 groups, covering historical periods from the Bronze Age through to the present in the form of a continuing Cultural Landscape. ICOMOS was not happy with all this and recommended deferral for a redefinition of the site (“the nominated sites form an accumulation of an excessive number of themes and overly different periods for the outstanding universal value of the serial property to be demonstrated”)! But the 2011 WHC was pretty “bolshie” and Egypt, Iraq, Jordan, Nigeria and Bahrain (with UAE also on the Committee itself!!) gathered enough support to overwhelm Estonia, Sweden, Switzerland and Australia and the ICOMOS recommendation was overturned. b. 6 oases scattered around the city which are still used to cultivate dates using Aflaj for irrigation and include a number of historic buildings including houses, souks, mosques and forts dating mainly from the 19th C.
c. A series of prehistoric tombs towards Jebel Hafeet, a 1200m mountain situated to the SE of Al Ain centre. We concentrated on driving up the superbly engineered Jebel Hafleet Mountain road (not part of the inscription) with a fine view of Al Ain from the top - the evening view of the city lighting up below seemed a very popular outing for the locals . The road has been called “the greatest driving road in the World” by US organisation “Edmunds.com”. It was ok, but perhaps they should get around a bit more! d. A further prehistoric site (Bidaa Bint Saud) 14kms north of Hili beyond the city outskirts and consisting of bronze and iron age tombs. We picked it up as we departed Al Ain going north – but the area is fenced off and locked. It is a few kms off the direct route to Dubai - take E95 and look out on the left for a “rocky outcrop” – it isn’t signposted! The site itself has a sign explaining what is inside but I wouldn’t bother unless you have a car and a bit of time! The “big” issue here is whether this site, as Abu Dhabi claims, really does provide evidence of Aflaj going back to the Iron Age. On our first afternoon/evening we saw some of b, together with a bit of c plus the mountain drive. On the next morning we saw more of b plus all of a (and d on our way out). We did see buses which could be used for a/b, which are really the prime sights, but even for these you ideally need your own car. The Bronze age remains at Hili (Group a) are presented in a rather “strange” way within an “Archaeological Park and Gardens” – and this means well watered green grass, flower beds and trees plus a restaurant, some kids playgrounds and a modern mosque of course for those essential prayers. I guess if you an Emirati wanting a day out with your family then some nice grass and trees could be just right - but the archaeological remains (primarily 3 tombs) seem very much a side show as you walk round this non-desert scene. ICOMOS was not over impressed! “Their nearby environments form landscapes associated with the desert, mountains and existing oases, but they are at times undermined by the proximity of anachronistic elements linked to contemporary development (theme park, modern constructions, road and hotel infrastructure, etc”. It also wasn’t convinced of the authenticity (“ICOMOS considers that the majority of the monumental tombs from the protohistoric eras were in ruins when discovered by archaeologists in the second half of the 20th century. While there is no doubt as to the authenticity of the sites and associated artefacts, certain tombs, often those considered the most important, have undergone restoration or even substantial reconstruction, notably the Grand Tomb in Hili Archaeological Park, which limits the scope of their authenticity”). Now this is a great shame, because the Grand Tomb at Hili was the highlight of the WHS as far as its archaeological remains are concerned. And now I don’t know how much of what I saw was “original” or genuinely restored by anastylosis. Assuming they are genuine, the carved Oryx above a recess in one of the beehive tombs were superb (Photo1). 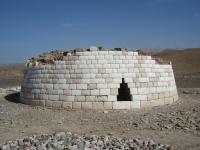 But the location wasn’t a patch on that of Oman’s own beehive tombs at Bat. The 6 oases present another “selection” problem for a visitor. That of “Al Ain” is close to what goes for “town centre” (a rather “scratty” early development not commensurate with Abu Dhabi’s current image and wealth!) near the National Museum. This only contains 3 rooms but is worth seeing for the overview it provides of the rest of the site and of the changes which have occurred in the last 50 years – it is situated next to one of the many forts which are included in the inscription. We were not able to venture far into the oasis as chemical spraying of the date palms was taking place and much of it was closed. So – to summarise. In my view the main interest to be gained from visiting this site relates more to seeing the way in which the UAE has developed than from its historic aspects – I must admit I prefer my desert sites and oases to be less developed. Based on what we saw, then the priorities from among all the sites available would be the main Hili tomb, followed by Jahili Fort, the National Museum and an Oasis. As a postscript – this description of Al Ain’s long term development strategy might be of interest in showing how gaining a WHS inscription was seen as an important step along the way. See Master_Planning_for_Heritage_Conservation_in_Al_Ain_Oasis_UAE . The listed locations of this site are to be found within as well as in the areas surrounding the modern city of Al Ain. Jebel Hafeet, a huge monolith stands to the south of the city, while Bida Bint Saud lies to the north, not far from the suburb of Hili which itself has several archaeological sites. These peripheral sites are easily accessible by road. The oases, each with its date palm plantations, aflaj, watchtowers and protective fort are within the city and are accessible by local bus services. My first impression of this site is of a modern city set out in a grid pattern divided by six lane dual carriageway boulevards. Although there are numerous multi-storey buildings, there are none on the scale of Dubai or Abu Dhabi city. But on closer inspection it is not difficult to find places of local heritage. The ancient Hafeet tombs can be found in several locations around the city, besides the slopes of Jebel Hafeet. I found some small circular stone tombs on a hillside near the Al Ain zoo which are particularly well preserved and accessible. Other larger ones were visible at Bida Bint Saud, near Hili and on the edge of the red sand dunes. I have seen other more elaborate types of tomb in the Hili Archaeological Park. Jebel Hafeet, a gigantic monolith that sits on the desert floor straddling the UAE/Oman border to the south of the city, reminds me of a rougher version Ayers Rock/Uluru in central Australia. This mountain has lost some of its integrity however due to the presence of a huge palace, a resort hotel and a restaurant. The present day city is located on the site of six wells/oases, the largest of which is Al Ain in the city centre, while others like Al Muraibi, Al Murabba, Al Jimi and Al Quattarah are in the suburbs. Each has its mud-brick walled date plantations and aflaj irrigation systems. They are each protected by watchtowers and a fort, most of which have recently undergone restoration. The Al Jahili fort in the city centre, a fine example of fort archtecture, presently houses a museum dedicated to the 20th century explorer Wilfred Thesiger, along with a display of his photographs of the region pre-oil. I found some early houses in the course of restoration amongst the modern residential districts. Traditional culture is represented by a huge camel market, and regular camel races are held at various racetracks around the city. I have yet to see falconry in practice, but one of my wife's Emirati pupils brought his pet falcon to school with him on National Day. I believe that this site should be listed to prevent more of its integrity being lost. ICOMOS advised a Deferral, for " definition and the selection of the serial components and to focus them on a main theme and/or a more coherent and better defined period"
Built in the 3rd Millennium BC: "The Cultural Sites of Al Ain trace the evolution of society in that part of the world from mobile hunter-gatherer groups of the Neolithic period (6th millennium to 4th millennium BC in Al Ain) with remains discovered alongside the eastern ridge of Jebel Hafit, to small- scale farming communities (3rd millennium BC Bronze Age communities)"
Disputed territories: Saudi Arabia claimed a large part of Abu Dhabi territory including the Buraimi Oasis where Al Ain is situated. Fighting took place in the 1950's involving the Trucial Oman Scouts - the British organised paramilitary unit for the "Trucial states. Saudi forces and supporters were expelled. In 1974 the Treaty of Jeddah was negotiated and Saudi in effect withdrew its claim but gaining elsewhere. UAE has never ratified this treaty.